Cloud computing provider Virtustream — a hot player in the enterprise cloud space — has raised another $15 million in investment capital. The money came from existing investors Intel Capital, Columbia Capital, Noro-Moseley Partners and TDF, as well as new investor QuestMark Capital.This round brings Virtustream’s total funding to $75 million. Virtustream’s xStream cloud platform is designed for mission-critical and heavy-duty enterprise applications such as SAP(s sap). The company touts big-name customers such as Pizza Hut, Domino Sugar and Intel (s intc), as well as gaming startup Digital Chocolate. Recently, Virtustream upped its enterprise (and government) appeal by announcing FISMA Moderate certification, a designation that underscores the cloud’s security protocol, even if FISMA is only applicable (and with regard to cloud computing, questionably so) to government agencies. There is plenty competition for those enterprise cloud workloads, though, including from Amazon Web Services (s amzn), Terremark/Verizon (s vz), IBM (s ibm), GoGrid, Tier 3 and the entire VMware vCloud ecosystem (s vmw). 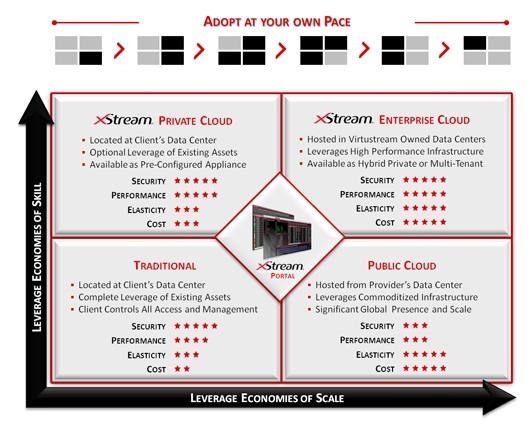 To its credit, Virtustream is striving to distinguish itself with a consumption-based pricing scheme as well as a mix of public, private and virtual private offerings. The company recently bought cloud computing pioneer Enomaly in order to work its SpotCloud technology into a federated platform for letting Virtustream customers buy and sell excess capacity among one another.